Bound to brighten any dish, this wonderful salsa is will lift your spirit while tantalizing your taste buds. As fragrant as they are nutritious, persimmons turn the traditionally tart and spicy combination into a more exciting experience for your palate, while the many health benefits energize your mind and body. 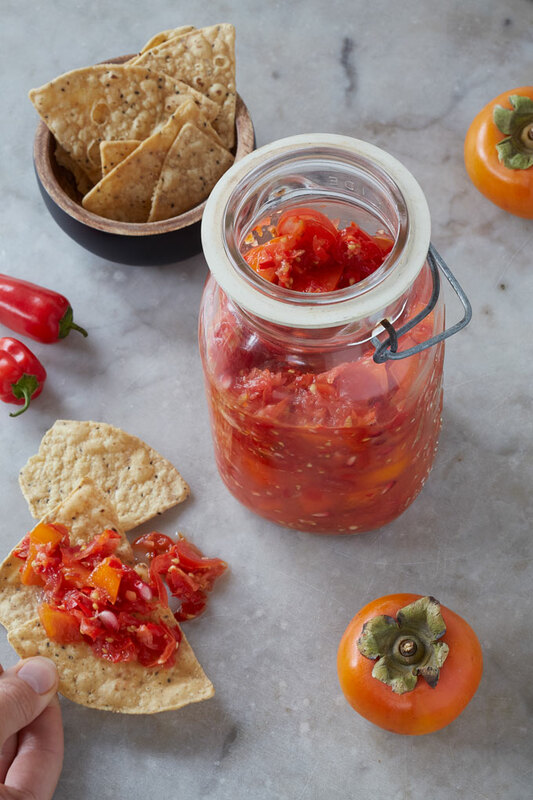 Aside from the standard tortilla chip or taco topping, this salsa can be used to garnish fish or salads and makes an excellent pairing for goat cheese or barbecued meats. It’s the prefect condiment for any Mediterranean or Latin flavored meal. Eat persimmons whenever possible! The persimmon is packed with vitamins and minerals that can aid in everything from eye health to digestion. But what’s truly special about this fruit is that it also contains proven anti-cancer and anti-tumor compounds. Persimmons contain phenolic compounds called catechins and gallocatechins that work to prevent various types of cancer along with an anti-tumor compound called betulinic acid. This little fruit can actually play a role in clearing tumors or stopping cancerous growth from metastasizing. Although I’m not suggesting that if you have cancer eating persimmons will cure you, consuming this powerful food can certainly play a role in staying healthy. Other nutrients include Vitamin A, Vitamin C, Vitamin E, Vitamin B6, Dietary fiber, Manganese, Copper, Magnesium, Potassium and Phosphorous, just to name a few. This isn’t to say that the other ingredients in this salsa aren’t just as valuable, but you probably already knew that garlic and tomatoes are good for you. And let’s not forget jalapeño! It too contains powerful anti-oxindant and anti-cancer properties. This salsa will not only make your meal more exciting, but will support your body in staying vibrantly healthy! Fuyu persimmons they have the nicest texture, crisp like an apple and least grainy. They’re best when allowed to ripen, but should still be firm and brightly colored (as in my photos). Scrub Fuyu persimmons and chop off the top leaf, then slice away with skins on. Chop into small bite size cubes by hand. Tossing them into the food processor will turn the meat into a pulp, causing the flavor to just blend in with the rest of the salsa mixture. The Cinnamon Persimmon and the Organic Sweet Pumpkin Persimmon are the two other varieties of persimmon that can be eaten when firm and would work well as substitutes for the Fuyu. The Japanese variety of persimmon, the Hachiya, has a thicker skin and needs to be allowed to ripen until soft. You will likely want to remove the skins. 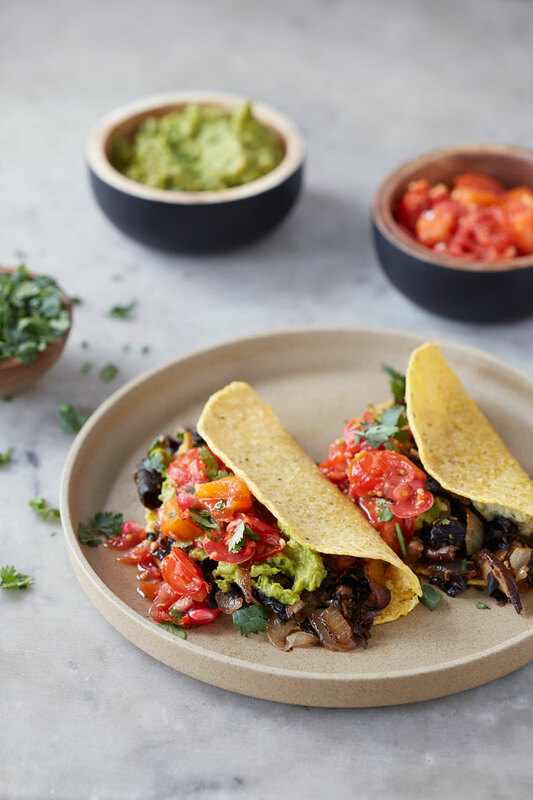 Don’t expect the persimmon flavor to stand out much, as the pulp-like meat will again blend into the salsa. Use gloves when handling this chili pepper! The juices will transfer and burn if you touch your eyes or face. If you can’t find fresh jalapeño pepper, rather than going with a dried powder, substitute with another mildly hot fresh chili pepper like the serrano. 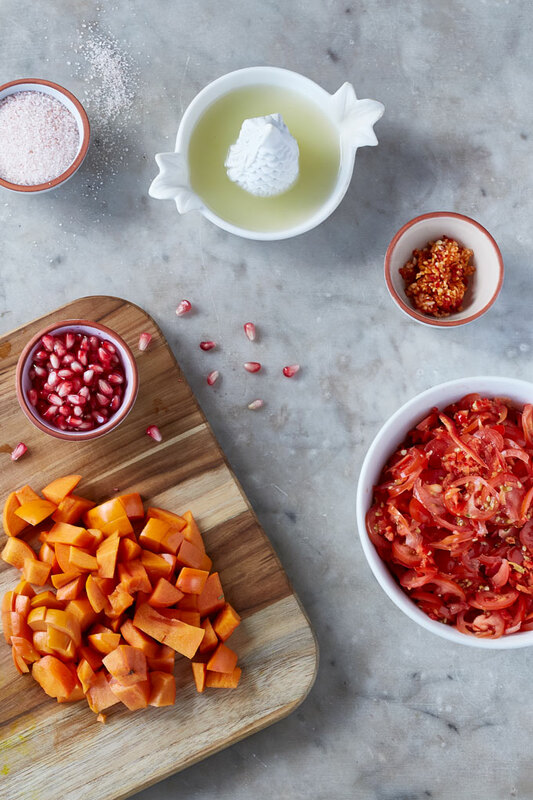 The addition of pomegranate is more aesthetic than anything (although also nutritious!). Pomegranate seeds compliment the salsa when had with chips or over a salad. Skip the pomegranate seeds when serving with tacos or meats–the bitter center becomes too prominent. 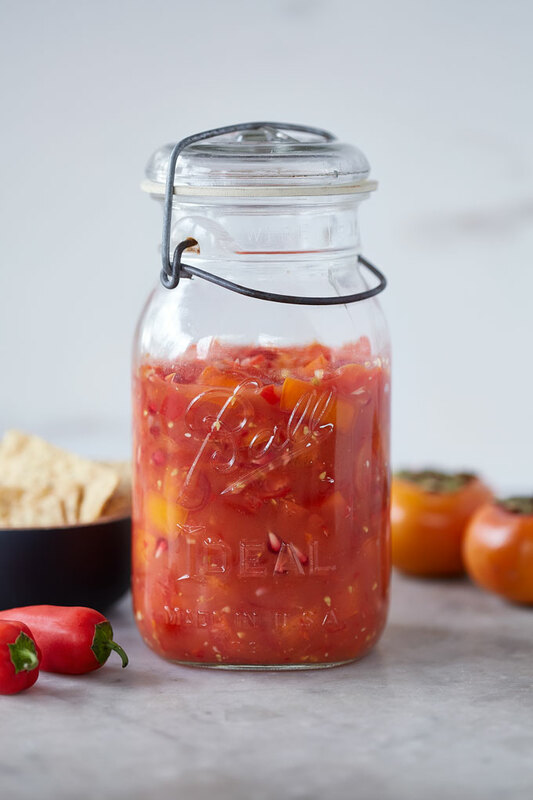 You can serve the salsa immediately, but if you have the time to let it marinade overnight, you’ll be in for an even more delicious treat. 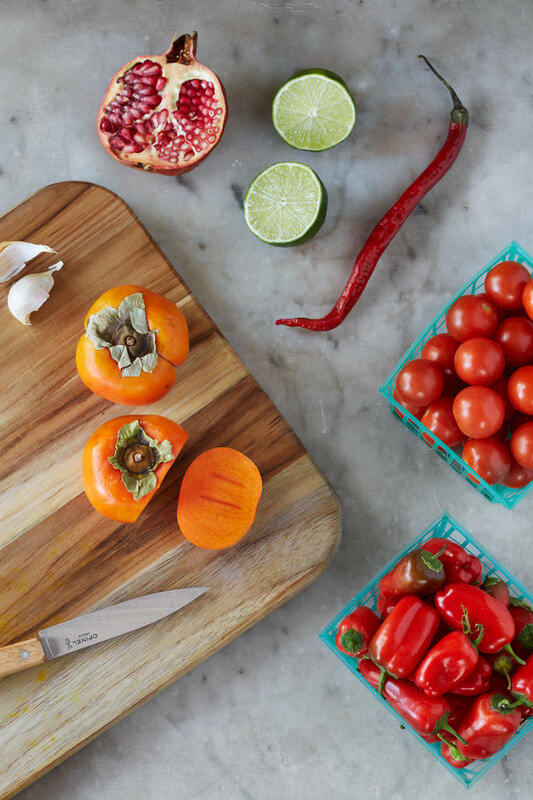 The fragrant, lightly sweet flavor of persimmons makes for perfect contrast with the heat of jalapeño. 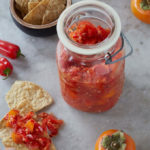 And there’s nothing better than a mouth-puckering, sweet and spicy salsa to top off your favorite tacos, brighten a salad or dress up meat dish. Using the standard blade, mince garlic and jalapeño chili. Switch out the blade for the 2mm slicing disk. Toss in and process chopped peppers and whole cherry tomatoes. Chop persimmons into small chunks by hand, roughly 1/3 inch thick cubes. Transfer chopped veggies, lime juice, salt and pepper in a bowl and mix well. Transfer to a 32 oz glass jar. Refrigerate and let marinade overnight. Mince garlic and jalapeño. Chop tomatoes and persimmons into small chunks, roughly 1/3 inch thick cubes. Slice peppers into thin, 1/2" or shorter slices. Continue with steps 4 + 5.